Shake Shack’s Cherry Blossom Shake Is Here — Is It Any Good? Well, it’s certainly pink. Photo: Jed Egan. The limited-edition, hyperseasonal drink is a tried-and-true marketing gimmick: Burger King’s Oreo Peppermint Shake, McDonald’s Shamrock Shake, Starbucks’ almighty Pumpkin Spice Latte. Perhaps unbeknownst to Americans, Shake Shack has also partaken in this seasonal tradition since 2016 — in Japan. The chain’s overseas outposts have released cherry blossom-flavored Shakes each year to celebrate the arrival of spring, and this year, Danny Meyer and co. have seen fit to bring a version of the shake to the U.S. For everyone who thinks that Japan gets all the good fast-food stunts — or anyone who just likes the subtle, floral flavor of sakura — this is extremely welcome news. So, is this the new semi-frozen drink that will finally overtake the Shamrock Shake’s springtime dominance, or is it just another fast-food shake with a slight Pepto-Bismol hue? We ordered a few and put them to the test. 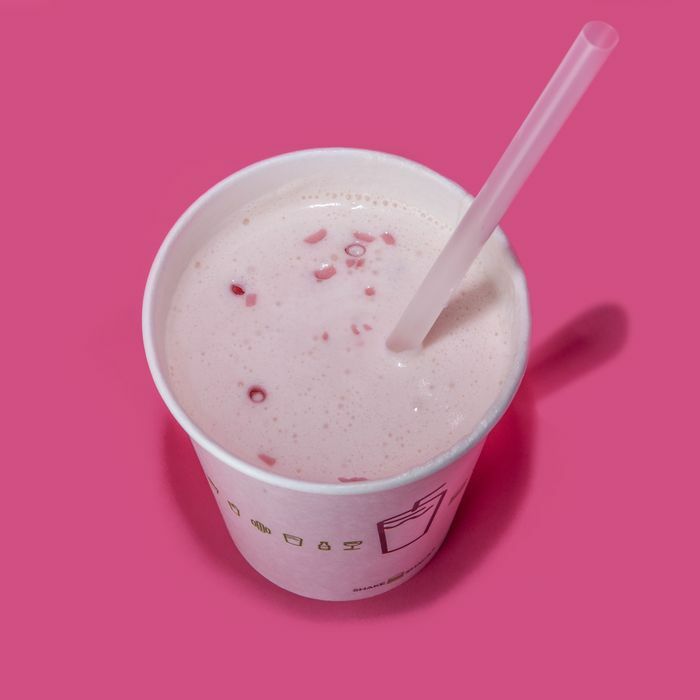 Shake Shack deserves credit for not making these shakes some unnatural shade of pink for the sake of Instagram. Instead, the chain says it makes this dessert by using cherry blossom extract. The result is a gentle rose hue. Little shavings of “pink chocolate” — white chocolate dyed pink — are sprinkled over the top. Unfortunately, those look a bit like melted wax or, perhaps less generously, like chopped up pencil erasers. Altogether, these shakes’ looks fall firmly in the “not offensive” category. The flavor is not exactly subtle. Like many fast-food shakes, the first thing that hits you is the intense sweetness. “I can already feel the sugar crash,” said one taster. The flavor of cherry blossoms is often described as gently sour and, when preserved, a touch salty. Unfortunately, any of those more delicate flavors are obliterated here by the sugar, and our tasters compared the shakes’ cherry flavor to things like Starbursts, Cherry Coke, and even the dreaded cough syrup. “It tastes like someone added Cheerwine to a vanilla milkshake,” noted one aficionado of the Southern soda. It’s not great, but for a chain shake, it’s also not terrible. Shake Shack could easily have gone Full Unicorn with this idea, so it’s laudable that they’ve kept things simple and relatively natural-seeming (although it’s worth noting that some of the half-finished-tasting shakes took a surprisingly long time to properly melt). In Japan, the chain reportedly released two versions of the Shake that changed through the sakura season, each with its own special packaging. Here — whether it’s because Americans aren’t as invested in the arrival of cherry blossoms, or maybe because the chain is just testing the seasonal-drink waters — the shake feels like something of an afterthought. The roll-out came with minimal marketing fanfare. For now, it wouldn’t be surprising if the shakes went back to being Japanese exclusives while the chain focused on developing its own American-focused recipes domestically. As it stands, they have about four and a half months to develop a drink that can steal some of the autumnal hype away from Starbucks’ pumpkin-spiced behemoth.